If your perfect vacation includes fishing, hiking, boating, rock climbing, skiing, rafting, sight seeing, or personal enrichment, this is the place for you.There’s lots to do in North Carolina. Sliding glass doors lead from the spacious Great Room to the wraparound deck, an ideal spot for reading, picnicking, or just whiling away the hours On the therma spa jacuzzi. 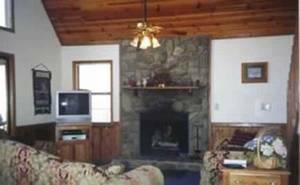 The Great Room features a native stone fireplace - just the place for warming up on those cool mountain nights. Gather 'round for a cup of steaming cocoa, an Irish Coffee, or whatever suits your taste. Snuggle with that special someone to the crackling of the fire, while outside, the crickets chirp a serenade. Twenty-seven inch TV with VCR and dvd players are provided for family evenings, with a healthy library of movies for your enjoyment. Upstairs, overlooking the Great Room, the roomy Master Suite offers sweeping views of mountains and nearby stream. The Master Suite has its own bath. Linens are included, and for your convenience, a washer and dryer are provided. Our 3 bedroom chalet is perfect for large families, friendly get-togethers, or group outings. For smaller families or groups, consider one of our cabins. 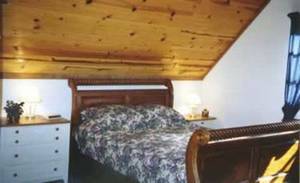 With 2 roomy bedrooms, they offer all the comfort of our Chalet, at a lower price. 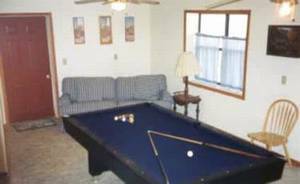 Full size pool table, Thermaspa jacuzzi and electronic dart board. We stayed at the Azalea Ridge Chalet for three days in April and it was enjoyable and relaxing. 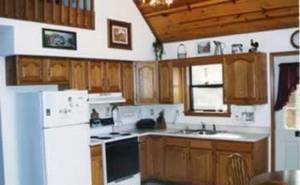 The cabin is in a great location and has all the amenities you'd ever need. The kids fished for trout across the road - caught 21 - and we jogged along Old River Road on a cool, clear Sunday. Many things to do in this area, the scenery was wonderful, and the sounds of rushing water very soothing. $90 per night after 1 week stay. $100 security deposit. Deposit: $100 security deposit. $150 pet deposit. Cancellations and Refunds: 30 cancellation for refunds.